Does Bucks County Baby Attacked by Family Dog Have Personal Injury Claim? Tragic Accidents Homeowner’s Insurance Does Not Cover. A recent tragic event that occurred when a 13- month old Bucks County Baby was attacked by the family dog made me think about what claims the young child could make against his parents through the family’s homeowner’s insurance. According to the police, a heroic man stepped in to stop the attack and saved the baby’s life after the 13- month old’s mother was not able to stop the dog during the attack. The dog responsible for attacking the child was owned by the family. The young child had serious bite wounds all over her body. The baby was transported to the hospital and underwent surgery. Although she was in critical condition, she is going to survive. The question that arises is can a young minor child make a claim against her parents for failing to monitor and control the dog that attacked the young child? And specifically, will the parents’ homeowner’s insurance company defend the claim and provide liability insurance for the parent in the event that she is successful in proving that her parents were negligent. Homeowner’s insurance provides a family owner with liability coverage in the event that a third party, not a family member, is injured on their property or in their home. Homeowner’s insurance will also cover incidents involving the homeowner s’ dog who bites a non-family member. Homeowner’s insurance will cover the cost of defending the lawsuit and will pay judgments up to the amount of the homeowners’ coverage. The typical homeowner’s policy provides $100,000 in coverage but a homeowner can elect to buy more coverage under the policy. The homeowner’s policy will cover slip and falls on the property such as a slip and fall on a slippery sidewalk or someone tripping down stairs that did not have a handrail. Homeowner’s insurance will not cover intentional acts. Now, that you have a little background as to what homeowner’s insurance covers, let’s get back to the unfortunate accident involving the minor child who was bitten by the family dog. In almost all incidences, the homeowner’s policy issued to the parents has a specific exclusion which would preclude a resident of the home, regardless of their age, from making a claim under the policy. In other words, a family member residing in the home can not make a claim under the homeowners’ policy. 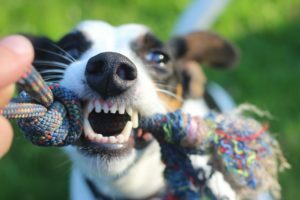 If it was a neighbor’s child who was bitten by the dog, the neighbor’s child through his or her parents could make a claim under the homeowners’ policy and the homeowner’s insurance company would defend the owners of the dog. In the example we are discussing, I would strongly recommend that the parents review the homeowner’s policy issued to them to see if there is a specific exclusion of family members making claims under the policy. By family members, I mean family members who live in the household and not relatives who are visiting. If you are a relative visiting the home and you are attacked by the homeowners’ dog, you will be able to make a claim under the policy. Regardless of whether the dog is on the property or off of the property when it causes injury, the dog owner’s homeowner’s insurance will defend and indemnify the homeowner. The above analysis is specifically focused on the issue of homeowners’ liability insurance and what it covers. Homeowner’s insurance does not have the same applications as auto insurance. For example, if a child is injured in a car accident driven by his or her parent, the child can make a claim against the parent for his or her injuries under the auto insurance policy issued to the parent. It is less likely that there is any family preclusion set forth in the auto policies. When dealing with homeowners’ policies or even auto insurance policies, it is always important to review the terms and conditions set forth in the policies to see if the insurance companies have precluded certain claims. In the homeowners’ insurance situation, as long as you are not a family member residing in the home that is being insured by the homeowner’s insurance policy, you should be entitled to make a claim against the homeowners’ insurance policy for injuries you received as a result of a negligent condition on the property. That being said, homeowner’s insurance companies defend the claims strongly and it is the burden of the claimant to prove that their injuries were caused by the negligence of the homeowner. Even though the homeowner insurance company’s obligation to defend the homeowner is contractual in nature, the claim made by the injured party is the same as any personal injury action. The claim is made against the homeowner. The insurance company is not named as a party but will defend and indemnify the homeowner. Insurance companies may also refuse to do business with a homeowner, or increase the homeowner’s premium, if the homeowner owns a dangerous breed of dog. Therefore, owners of dangerous dogs may have additional challenges in having their homeowners insurance defend and indemnify them should their dog attack and cause serious injury. In summary, personal injury claims against dog owners may be covered under the dog owner’s homeowner’s insurance policy, with certain exceptions, such as claims from family members living in the home. Dog owners should read their policy carefully to understand their policy coverage. And it is best to contact an experienced personal injury attorney to pursue an injury claim under a homeowner’s insurance policy.